Such lovely gifts you received, the bag is fantastic!! I've said it before but I am always impressed at how much you accomplish and your organizational skills. All your projects are lovely and so as the gifts. I'm glad Chatelaine is getting a focus month. You'll (we'll) see all sorts of progress! Are there beads as well on these? I can't remember and Google is sooo faaar away. Great gifts stitched on and received. I love the bag of course. It has a dragon on it. Beautiful! Thanks for the plug. The giveaways have been posted. Wow...as always, your projects are all lovely. I think I could stare at the map for ages, it looks like there is a lot going on in it! What fun! It's amazing all the stitching you are able to accomplish! Can't wait to see progress on your Chatelaine too, what a lovely piece so far! Congratulations on the bag, that is so much fun! Great progress on all your GG pieces Jo - I do love the Discworld Mappe. Lovely projects and progress Jo. Love the map. Beautiful projects, beautiful stitching. I did enjoy reading your blog today. Fabulous and stunning prize from Christine. Discowrld is coming along nicely. A varied selection of projects. Your Chatelaine work has given me the nudge I need to get back to my Alpine Seasons Garden. What a terrific gift from Christine. She is so creative. Lovely to see your Chatelaine again. Fabulous gifts from Steph and amazing pouch from Christine. Off to visit the valentine hoppers now. You received lovely gifts from Christine and Steph. The bag sia mazing. Good progress on other gifts. Love love loving your Discworld mappe. I'm really looking forward to seeing this one develop. 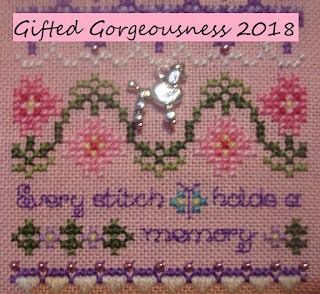 My second favourite will have to be your gifted book pouch from Christine! Wow it's brilliant and yes the tag is as awesome. 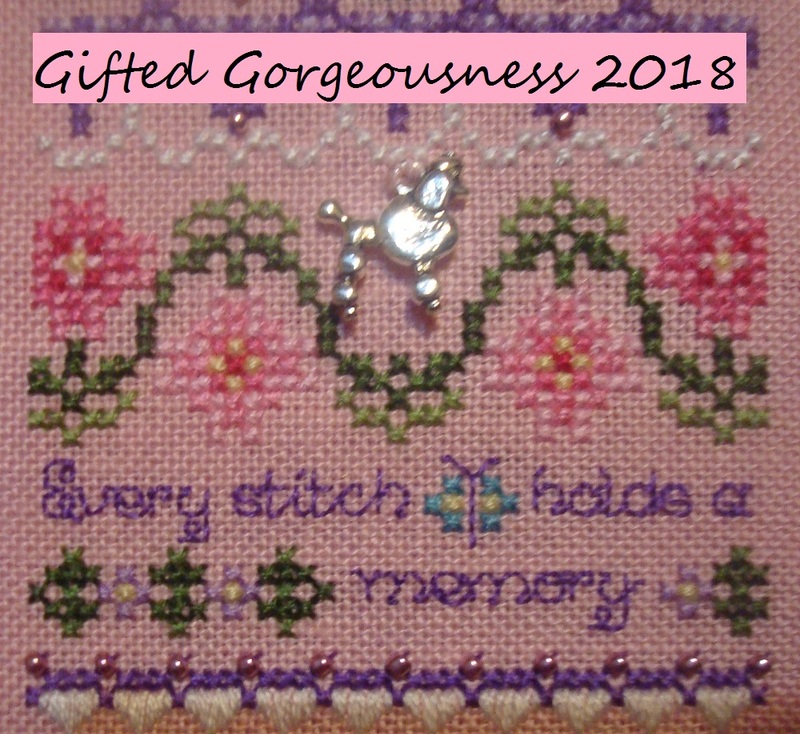 I'm in awe of your specialty stitches on Diamond and the Chatelaine. You're amazeballs Jo! I LOVE the beautiful gifts your received, Jo. Oh, you are so lucky! Kisses, my friend. Great crowd this month and love your progress on Discworld, plus that is an amazing bag, wow!! oops, sorry, only just squeezed in before Mr Linky expired! Phew! P.S. I love how Discworld is coming along!